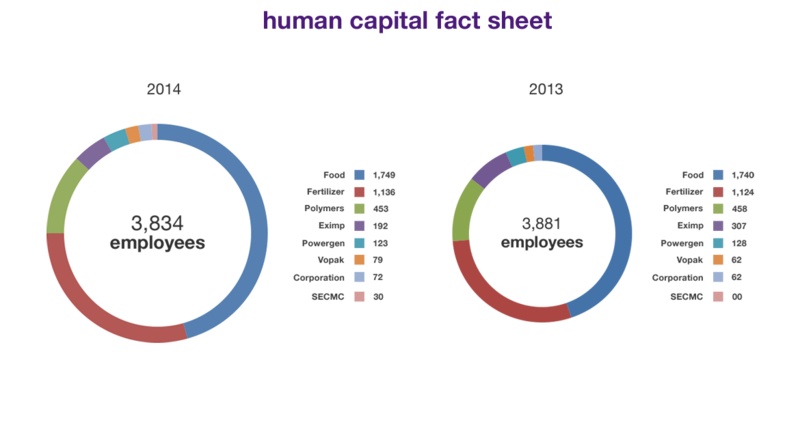 In line with our analysis we devised a 3 year aggressive Human Capital (HC) & Talent strategy to ensure that our people come to work for an experience; remain engaged & aligned; ready to make their valuable contribution to our superior business performance. After looking at the current indicators and carrying out an in-depth analysis of our HR practices, the resulting strategy focused on developing an enabling organizational culture that improves diversity and inclusion, employee engagement and the leadership pipeline. A hybrid Training Framework that includes flagship programs from Dale Carnegie, Aon Hewitt, LUMS & KSBL was developed and introduced. Mapped against our competencies, the program has been tailor made to meet the development needs of our employees. Working with the international training consultants - Dale Carnegie, two different flagship programs were created based on our leadership competency model. This comprehensive framework enables us to embed key values and enhance the required skill-set of our employees to strengthen progress at Engro. In line with our Diversity mandate, a focused course on Diversity was arranged for our senior & middle management to instil a tolerant & diverse working environment. In order to ensure all employee development plans are successfully executed, detailed training need analysis was carried out by all HRs so that we can guide & equip our employees to realize their full potential & continue to provide them with opportunities for acquisition of knowledge for technical & managerial skills through various classroom & on the job learning exercises. 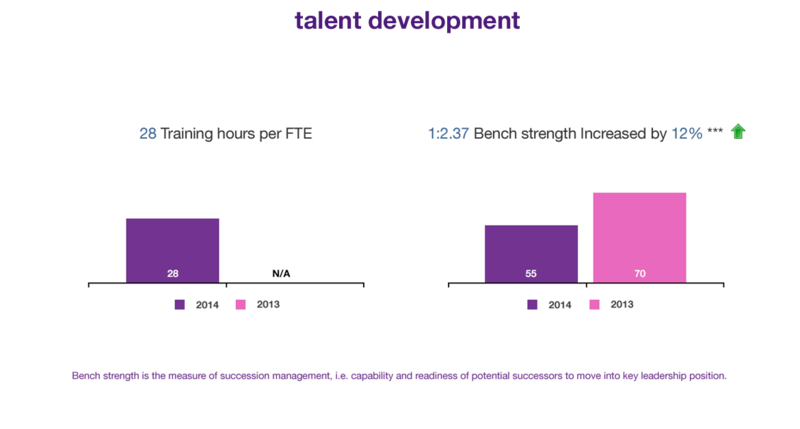 The average number of training hours are now recorded and included in the HR KPI’s to ensure that there is a constant focus on employee development. 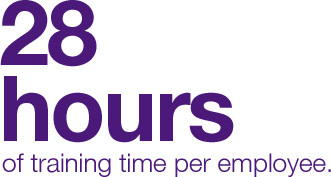 We set out to ensure all employees (T3 and above) went through a minimum 20 hrs of mandatory training time and we exceeded targets with 28 hours of training time per employee. In order to equip our Top Talent employees further, we consciously integrate mentoring within our corporate framework as a meaningful two-way exchange designed to accelerate leadership development, boost employee morale & provide avenues for long term career development. In this regard, a formal mentorship program for all Top Talent employees was also launched, thus, paving the way for transforming Engro’s Top Talent into leaders of tomorrow by effective guidance received from the Mentors. 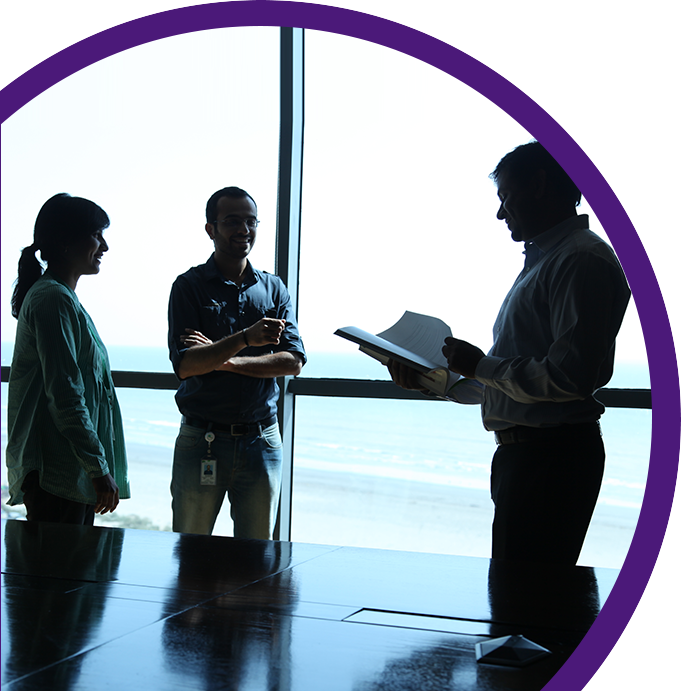 A highly effective and comprehensive CEO succession planning framework has been developed looking at key competencies and functional skills required for each CEO role at Engro. The 7 step framework for CEO succession maps our existing leadership pipeline with the company’s 3-5 years strategy, furthermore, it also takes into account each successor’s functional & leadership competencies & charting out a robust development plan ensuring a healthy pipeline against each position. The D&I Council works on a multi-pronged agenda to drive business results and ensure a healthy pipeline of a diverse workforce and draw from their strengths to meet the business objectives. Furthermore, the Council also helps to build a culture of inclusion – educating relevant stakeholders and driving conversations to ensure that there is no lack of adherence. A key ambit of the D&I Council is also to institute and implement flexible work practices and forge community partnerships andengagement with external stakeholders to champion the Company’s stance as a diversity leader in its category. The D&I Council is further supported and assisted in its mandate by the D&I Change Agents – these are change champions instituted in each of our subsidiaries with a clear objective to implement all articulated diversity and inclusion plans.In order to achieve our diversity goal of having at least 10% female population in our workforce and deploy a more enabling environment, we have developed a series of strategic initiatives aimed at our employees with a focus on growing and retaining the diverse talent that makes our businesses thrive. Empowering women within & outside of Engro to grow and join the workforce is a high priority for us and company wise goals and targets for gender equality have been introduced. As of 2014, we have achieved our target of 1:9 - a year in advance - which is a 29% increase in the number of women employees. Overall this translates to 10% women in the workforce. Going forward our focus has been reset to ensure that we retain the current female employees in every subsidiary. In this regard ‘Sensitization Workshops’ were held across the group targeting key employees to highlight the importance of diversity. Our aim was to target all Executives and Managers who can benefit and inculcate a culture of inclusiveness & support towards women in the organization. The sensitization sesions managed to touch 100% employees during the year 2014. A great achievement for Engro was the successful implementation of the proposed initiatives of NowPDP (Network of Organizations Working for People with Disabilities) that fuel our disability agenda across the board through our various subsidiaries. 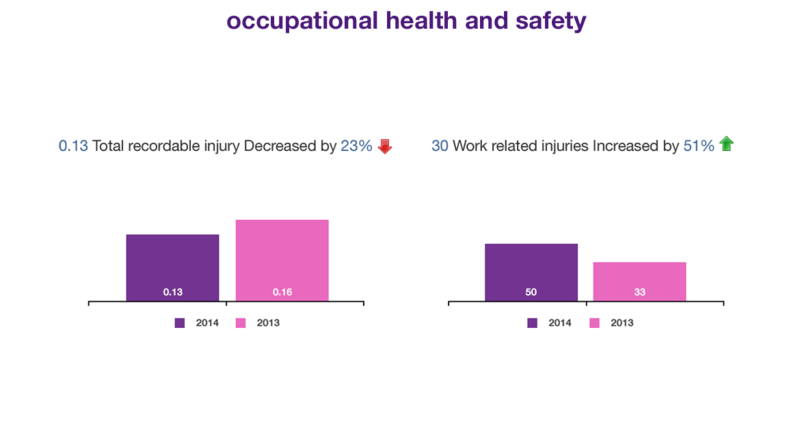 Perception Surveys were held with approximately 15% of the employees across our seven subsidiaries to gain an understanding of the issues and myths surrounding employment of persons with disabilities. Sensitization Trainings stemmed from these focus groups highlighting corrective actions for attitudes that fuel stigma and institutionalize discrimination against persons with disabilities. These were held for all employees at the head-office (95% covered) & at plant sites (85% covered). A Disability Task Force was then constituted with representation of all subsidiaries to drive strategic focus areas and ensure sensitization trainings covering 75% of our plant facilities. Simultaneously, a review of all employee related policies was also undertaken to ensure that Engro abides by all local and international regulations pertaining to employment of people with disabilities. A Job Profile Review was also undertaken to identify which employment positions can accommodate PWDs. Our commitment to ensure a far greater proportion of people with disabilities actively involved in social and economic activities has meant that this year we have had a 10% increase in the number of PWD employed at Engro. We will be instituting an affirmative action plan that will further improve employment outcomes for people with disability thereby living our vision of creating value for an inclusive group of stakeholders. For over half a century we have dedicated ourselves to core values of merit, tolerance & non-discrimination to foster an enabling environment for everyone. We see diversity and inclusiveness as an ongoing commitment that is reflected in our services and our innovation process that continues to fuel our passion for creating inclusive value for all. A review was conducted of our hiring process and a new system was implemented. 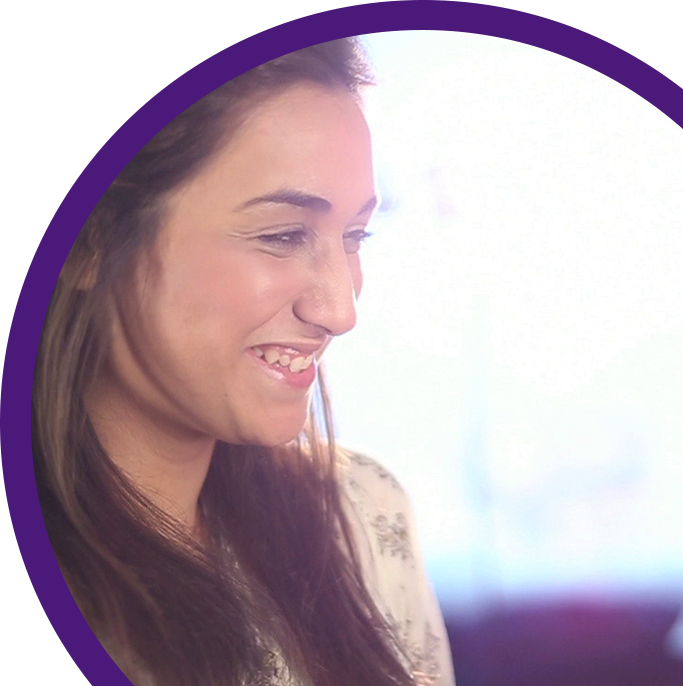 The development of our group wide Recruitment Portal (www.careers.engro.com) has vastly improved our hiring process. The automation of our hiring process has significantly reduced the time taken to hire so that an employee is now hired in 29 days (a reduction of 46 days since 2013). Career growth is also an integral part of our employee engagement with a constant focus on addressing individual development and issues under key impact areas which include work-life balance; performance management; career growth; and training & development. Employee Engagement is now an integral part of all manager KPIs and is strongly embedded in our culture with constant feedback available through various focus groups and other platforms. We have leveraged internal talent across the group facilitating internal growth and career moves for employees. 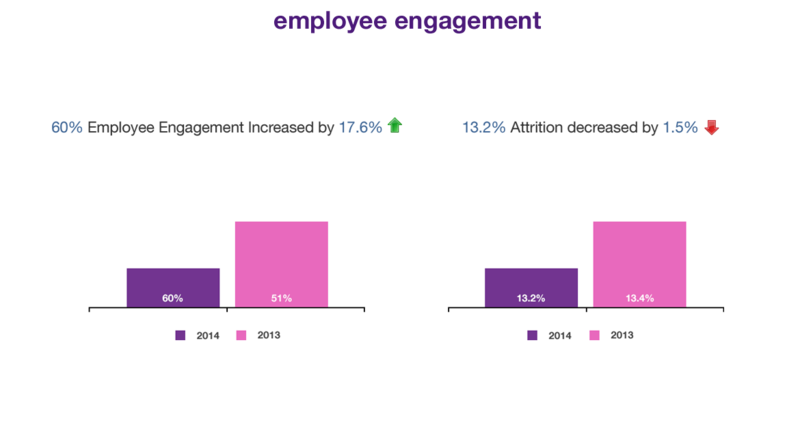 This high focus on engagement has resulted in us exceeding our target set in 2013 so that that internal movement across the group in 2014 has increased to 57.5%. 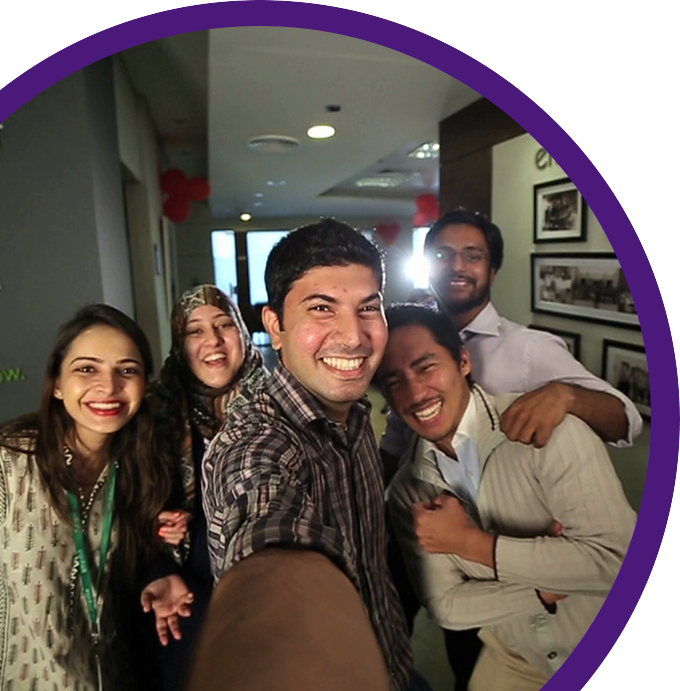 We constantly strive to achieve functional excellence so that HR processes at Engro comply with best in class internal and international best practices. We carried out an HR Audit where Engro’s HR Processes were benchmarked against the 25 best companies across Asia Pacific & the Middle East & aligned to 75% & above of the industry practices. The survey looked at 8 HR Processes that had 78 dimensions to compare with. Our HR process compliance now stands at 64% in 2014 which is a 14% increase from 2013. An action plan to go above and beyond 75% compliance is already in place focusing on work-life balance, health & well-being & recruitment & on-boarding. A systematic program to upgrade Human Resources Information Systems (HRIS) across the group was initiated in 2014 with an objective to enhance workforce productivity, enabling business communication and collaboration to effectively meet present and future business needs. The HRIS system is being designed so that it fuels the one-group culture and provides one-window solutions for all HR modules. While the development and implementation of these systems is ongoing, the automation of performance appraisal has been completed and a state of the art online recruitment portal will also be launched this year. In order to build in increased operational excellence we also conducted an alignment and standardization exercise of all rewards and benefits policies across Engro where over 250 policies were reviewed and aligned for inconsistencies. Moreover, through the year we also worked with leading HR consultants Aon Hewitt to evaluate all job roles across the board whilst also training the HR heads and leads on job evaluation methodology in an effort to increase synergy across the organization. To ensure that we remain the most sought after employer amongst a varied group of individuals, we continued our focus on implementing a holistic strategy for employee engagement and organizational development. Earlier we had identified the high impact areas and through the year we demonstrated a group-wide emphasis on these key determinants which included areas such as performance management, career growth, work life balance and training & development. In addition we recalibrated our engagement strategy through frequent focus groups that were conducted during the year; consequently, exceeding our target set in 2013 and achieving a stellar engagement index of 62% on a consolidated group-wide basis. Engros initiative to take the Talent Management to the next level combines the quality of staying close to its roots by guiding people through their career and betting on homegrown talent with newest technology and progressive virtual assessments. 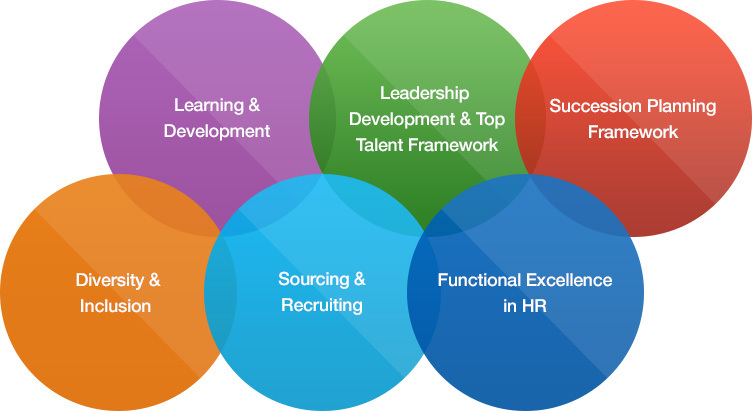 The talent framework lives up to the aspiration of top management to Lead from the front. The HR team challenges the status quo to keep the processes at the forefront of similar international organizations while at the same time being true to principles like always hiring for the next level and benchmarking the talent to inhouse high performance criteria. The dedicated HR team can achieve this only by the strong support of the topteam who on top of the talent development aspects also commits to give diversity a true vision in Pakistan.